UPDATE: Photos and videos from the scene of the crash have been added below. 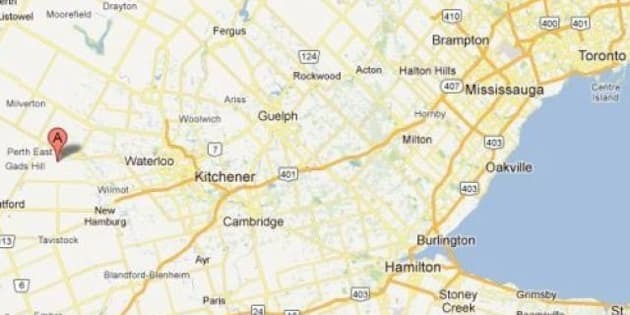 A passenger van crash west of Waterloo, Ont., has reportedly left at least 11 people dead. According to The Record, the van was broadsided by a flatbed truck in the tiny hamlet Hampstead at around 4:45pm ET. The driver of the truck, along with 10 occupants of the van have been pronounced dead. Three survivors were taken to hospitals in nearby Stratford and Hamilton. Their condition remains unknown. The collision reportedly took place at Perth Road 107 and Line 47 in a rural area of Hampstead, Perth County. CTV News is reporting the truck was travelling in the southbound lane when it struck the side of the passenger van. The impact propelled van into the side of a nearby house. The truck, according to CBC News, flipped onto its roof. Local journalist Elizabeth Cooper, who was on the scene, said the passenger van was "almost unrecognizable". Road visibility, she added, was good at the time of the crash. “My staff have never been to anything this horrific,” Linda Rockwood,director of Perth County EMS told The London Free Press. “It’s not anything they’ve ever had to do before. "To have that many people die at one time is absolutely horrific." Another report from CTV describes the first witness on the scene hearing a loud crash and running outside to find a crumpled van against the side of a house. He tried speaking to passengers he heard moaning inside a language barrier, suggesting the occupants were migrant workers. At a press conference Monday night, OPP Insp. Steve Porter confirmed the van passengers were migrant workers. He said ten were pronounced dead at the scene along with the truck driver. Police said one survivor was airlifted to hospital in Hamilton with life-threatening injuries, while two others are being treated for serious injuries in nearby Stratford, Ont. "I've been on the job for 28 years and I've never seen anything quite like this collision tonight with 11 people killed in one crash," Porter told reporters.